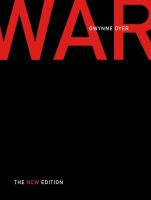 A few weeks ago I was able to listen to Gwynne at my local library http://www.therealjohndavidson.com/2017/04/gwynne-dyer.html His talk inspired me to read one of his earlier books (based on a tv series), "War." War seems like a natural part of human history. All our history seems to revolve around wars with the winners telling the stories. Gwynne goes beyond recorded history to start his account. Studies done in World II and further back to the American Civil War revealed a strange thing in that most soldiers did not fire their guns to kill. Up until recently most soldiers were trained how to use weapons and obey orders, but little attention focused on motivating them to actually kill. That has changed and Dyer gives the example of marine basic training. War as we know was not natural for hunter gatherers who often kept away from contested areas and even needed other groups for intermarriage. When conflicts occurred (sometimes a result of famine or drought) humans learned that aggressiveness paid off resulting in more resources including mating which in turn led to more aggressiveness. When historical forces resulted in cities, conflicts became more common. To reinforce the need to kill one early development was the phalanx, originating in Mesopotamia. It was with soldiers lined up in rows with the back rows pushing forward. The Romans perfected this strategy and conquered much of the known world. Tactics didn't change much, although many elements were added. Horses were effective and had been bred to carry heavier loads. They could be counteracted, and even elephants as well. The big development was with guns preceded by bows and arrows. They killed at a distance. A little before WW I one response to guns was trenches. They effectively stalled forward movement. Airplanes first used in WW I were used for reconnaissance, and bombing. A strategy developed to cut off supplies meaning that cities and civilians would be attacked. Previously one's fate was decided on the battlefield, but non combatants became targets. World War II ushered in the nuclear age. The Germans had previously used V2 rockets to inflict danger from a distance. It was possible to kill people without being consciously aware of them as humans. The nuclear option obviously changed ideas. The great powers realized if they used them against other great powers it would be the end for all. Conventional wars were generally involving lesser powers. Dwight Eisenhower warned about the power and influence of the military industrial complex. Ammunition and weapons manufacturing have been politically powerful and naturally identify enemies to cause fear. Dyer discusses guerrilla wars that can only succeed when there is political will behind them. Two successful examples are Mao Tse Tung and Fidel Castro. Terrorists do what they do because they cannot mount an army. The book was revised in 2004, so does not cover drones or ISIL. Gwynne has been keeping up with developments and thinks the dynamics have not changed critically. Dyer sees some hope after a case study of baboons in Kenya using a quote from Frans de Waal., "The good news for humans is that it looks like once established peaceful conditions can be maintained. And if baboons can do it why not us?" It seems over twenty years ago the leaders of one baboon group, very aggressive and belligerent to females and lesser males claimed exclusivity over a dump that contained poisonous food resulting in their deaths. Anthropologists studying the result over the years noted that the surviving baboons did not pick up the aggressiveness and belligerency of their predecessors and managed to live in peace. The author traces the problem to the beginning of civilization. Prior to that hunter-gatherers lived in small groups that were relatively equalitarian, It is only when agriculture allowed humans to live in one place and to greatly increase their numbers that top down decisions became common. This began power struggles that escalated to nation states contesting one another on a wide variety of issues. Dyer identifies three trends that will demand global attention. Climate change if not checked will accelerate and cross all borders. New nations will rise in power for example China, India, Korea and Brazil questioning the old order. And third, technology will advance beyond the nuclear threat. Quoting: "the rising powers must be absorbed into a system that emphasizes co-operation and makes room for them, rather than one one that deals in confrontation and raw military power. If they are obliged to play the traditional great power game of winners and losers then history will repeat itself and everyone loses." Military concerns take attention from climate change. Multi lateral systems must survive or we won't. The United Nations is certainly imperfect, but it is the best tool we have. The League of Nations was a first step, but founders afraid of being too restricted. The United Nations was formed with a more realistic format, but still faces a long path to world wide peace. Progress will be uneven. Nuclear weapons still attract insecure nations and the more widespread the more likely a problem. Still some nations have rejected including Canada, Japan, Germany, Sweden and Switzerland. A few others have pulled back such as Argentina, Brazil and more recently Libya. There is a lot of details with many historical examples to ponder. Dyer, even today is fairly optimistic. The critical factor now is mass communications. People at all levels are more aware of world news.